Audit findings have revealed how staff defrauded Kenya Airways of millions of shillings while top management enjoyed themselves globe-trotting with their families and lovers.Both airline middle and top cadres exhibited gross disloyalty to the national carrier for years on end while inept CEOs chased millions worth of commissions from procurement deals. Knowledgeable sources have told Kenya Confidential that commissions running into hundreds of millions of dollars changed hands during procurement of aircraft and top notch staff acquired properties locally and internationally. Kenya Confidential is investigating mega payments running into billions of shillings to top management and directors in bribes and corrupt deals. During dictator Daniel arap Moi era, Kenya Airways was treated like his personal airline and his cronies made a kill on procurement and lease of aircraft. Some aircraft were leased through opaque deals involving Irish airline Aer Lingus and Australian Ansett owned by the father of then powerful total man Nicholas Biwott‘s wife. Kenya Confidential is investigating reports that Kenya Airways switch from European manufacturer Airbus to American Boeng that culminated in Dream Liners 787, was piloted by commissions payable from the misguided purchase of the planes driven by former CEO Titus Naikuni. The wheel dealers are said to be now making money in resale and hiring out of the ill-fated Dream Liners. Naikuni would later concede that the airlines ten-year strategic plan was wrong. Such high-sounding multi-billion-shilling plans in public corporates are usually games of financial convolutions with layers of commissions and kick-backs that are paid even before they take-off. The bigger the figures, the higher the commissions and bribes. Manipulating forex exchange fluctuations, top marketing officials at Kenya Airways exposed the airline to over Ksh400 million loss by selling foreign currencies below market rates. 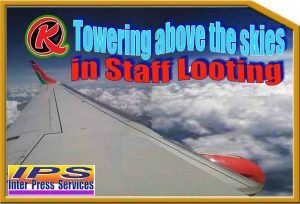 KQ was also found to be buying fuel at inflated prices, in findings that point to dishonesty and thieving staff. The audit report has highlighted thirty-two transactions as highly revealing where KQ officials colluded with bankers to sell the South African Rand and Emirati Dirham below the market prices in exchange for bribes. The banks would then discreetly give kick-backs, read bribes, to the KQ officials, in one of the many ways the airline is financially haemorrhaging. In addition KQ faced a loss of Ksh 4,750,000 resulting from the sale of South African Rand ZAR 5 million at a lower rate of Ksh 6.75 to the ZAR as opposed to the prevailing market rate of Ksh 7.7 to the ZAR, a confidential audit report by audit firm Deloitte reveals. The Rand is one of the currencies that the airline receives payments for tickets sold by the agents in South Africa . KQ contracted audit form Deloitte to execute a forensic audit, looking into the internal weakness at the national carrier. In another finding, top officials in the finance department inflated bank charges paid to Dubai Bank by Ksh14 million, relating to a Ksh 700 million ($7 million) guarantee sought by the airline. “This facility was Ksh 155,900,000 above the KQ board approved limit. The bank guarantee facility letter was signed by MD Mbuvi Ngunze who has been struggling to hang on and Alex Mbugua in their capacity as the CEO/MD and finance director respectively. The officials breached the ceiling amounts for the size of bank guarantee approved by the Board of Directors. The airline allows the top management to access a maximum of Ksh 500 million in bank guarantees. It was also found that the airline in some instances did not receive revenues earned in different countries, only for transfers to be made to private bank accounts of the officials. Lionel Messi tax fraud trial begins in Barcelona Audit names KQ managers, lender and suppliers in scheme to defraud airline. An officer identified as Itegi Githinji received Ksh 14.5 million, which was due to the airline, aside from Ksh 23 million secretly withdrawn from Dubai Bank – believed to be a kickback for the margins earned from the irregular forex repatriation skewed contracts. Deloitte reports that the airline was buying fuel at prices that were significantly higher than market rates, owing to biased procurement procedures. It observes that KQ carried out its tenders within short periods and from January 2013 to July 2015 there were no tenders issued. Instead there were last-minute negotiations with the suppliers so as to manage the risk of not supplying after the contractual period. The forensic auditors the fuel procurement since 2010 left a lot to be desired. Fuel makes up 40 per cent of the airline’s direct costs in any financial year. “We also noted that this reactive procuring did not have a structured plan, failure to which the negotiations are limited hence KQ incurring a possible high cost,” says the audit firm. Deloitte noted there was serious violation of the procurement performance management procedures by the fuel purchasing manager. Should there arise any dispute between the airline and the supplier out of the process of supply of jet fuel, the airline will likely find itself inadequately protected and unable to enforce its rights and protections that should have been clearly laid out in the formal contract and a copy at hand. The jua kali and don’t care management of Kenya’s national carrier is a reflection of how CEOs in public organization do not care about financial plunder. Many consider parastatal firms as means to employ their relatives, girlfriends and boyfriends and cart home public funds while the sun shines. They have no personal loyalty or commitment to the success of the public firms – yet the government turns a blind eye to the blatant nepotism, favourism and looting. 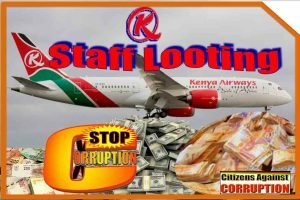 Kenya Airways management declined Anti-Corruption Awareness initiative that would target both the staff and general public, which is common resistance will all public institutions including ministries. That leaves President Uhuru Kenyatta as a lone Ranger in a campaign senior public officers attach no importance to.